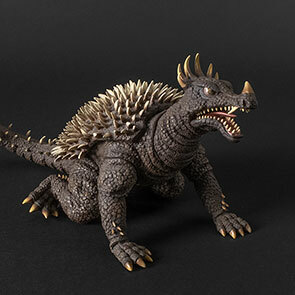 The final Godzilla design from the Showa-era gets the X-Plus treatment. This review is for the Ric Boy version which includes additional an extra arm and Mechagodzilla head. The rest of the review still applies to the more common Standard Version of this release. One of the highlights of this figure is its intricate surface. 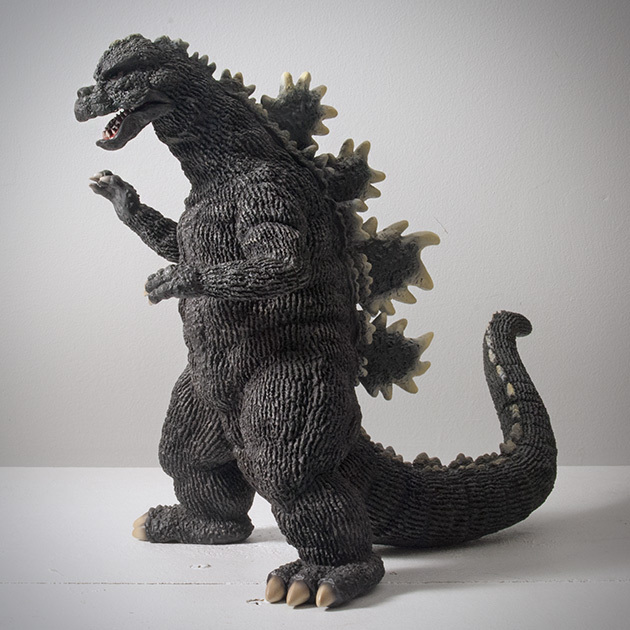 The combed Godzilla “tree bark” texture is VERY finely detailed and looks incredible. This one feature alone makes this a stellar X-Plus figure. Fingers are not individually sculpted. Meh. Ever since the first teaser photos of this figure appeared, collectors have been expressing concern that the upper lip is not accurate. In the movie, the upper lip typically curved upward in the center revealing the front teeth. But on this sculpt, it seems the lip definitely makes a detour from the actual suit. Not a dealbreaker for me, but many collectors have already modified their figures to correct them. Whoa, look at the teeth! Beautiful, individually sculpted needle-like incisors wrap around the upper and lower jaws. It’s a shame that the upper row is hidden under the lip making it necessary to look up into the mouth to even see them. Now THIS is why I collect X-Plus! 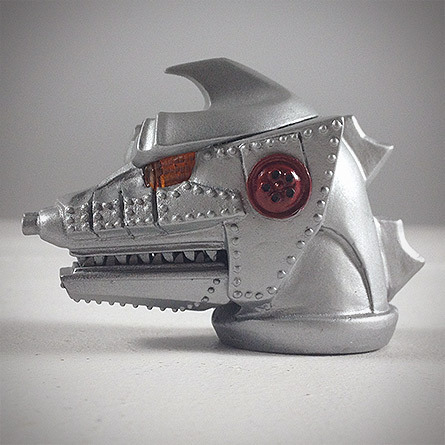 The Ric Boy Exclusive Version of this release comes with 2 additional pieces: a Mechagodzilla head and a specially shaped left arm with which to hold it allowing you to re-enact a scene from the movie “Terror of Mechagodzilla”. I don’t usually dish out the extra money to get the special exclusive versions, but this figure is definitely one of the exceptions! 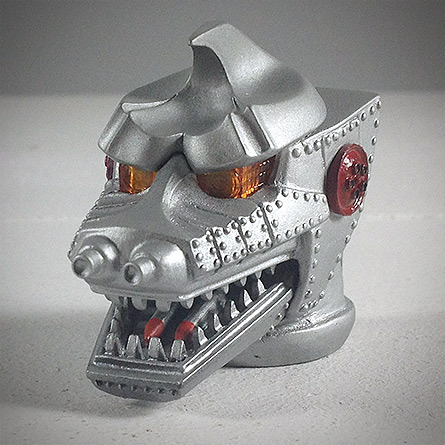 The extra Mechagodzilla head looks fantastic the same as the heads on the recently released full Mechagodzilla 1974 and Mechagodzilla 1975 figures. But if you don’t own either of those, read on. The head has fantastic detail with individual bolts, weapons in the mouth (which has a hinged jaw) and yellow, plastic eye pieces. It’s interesting to note that though the jaws were hinged on both of the full figures, the mouth could never actually stay closed. The bodyless head from this release has a jaw which really closes up and stays that way. The left arm can be rotated at the bicep. This is possible because the Ric Boy version has an extra arm which is better suited to hold the severed Mechagodzilla head. But even without this extra arm, the standard version allows you to rotate the standard arm. 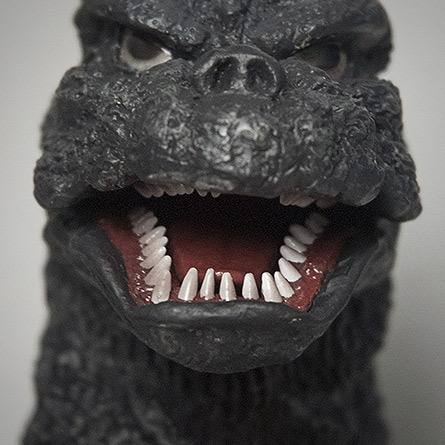 There are usually seams on the arms of X-Plus Godzilla figures but they’re glued and meant to be hidden. The left arm on this figure, though, does have a slightly noticeable line running around the bicep. 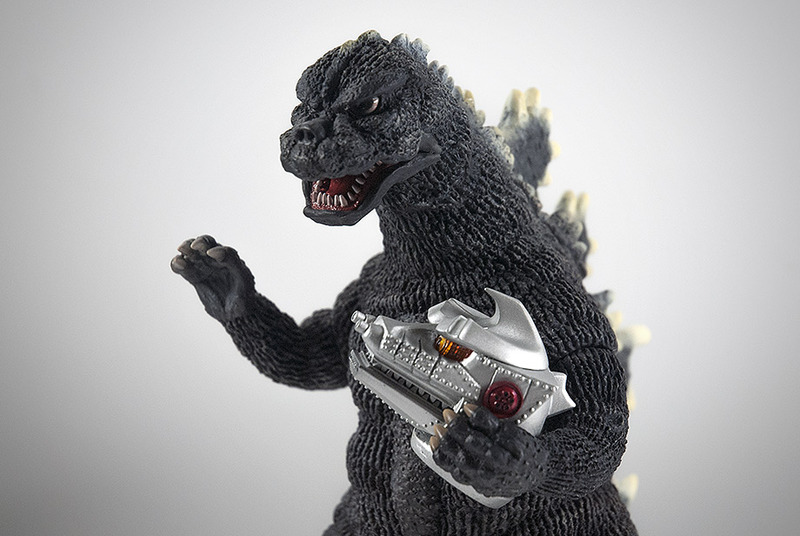 This arm is meant to be removed and switched with the extra arm which can hold Mechagodzilla’s head. 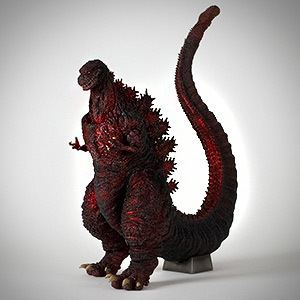 Often you can see line around the tail joint on many X-Plus Godzilla figures. One this one, though, the joint is much closer to the body and thus more hidden from the rear. The tradeoff though is the there is a triangular seam visible from the front under the groin area. From the front, the right arm seems a bit awkward to me. It’s almost like he’s waving or dancing. But, as you can see, all other angles are interesting and dynamic. Click here or on the photo above for a larger view. 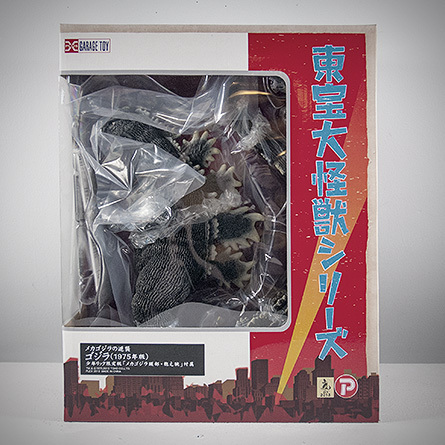 The standard Godzilla black on this figure has been highlighted with a dusting of a slightly lighter color over most of finely textured skin which looks unbelieveably awesome. 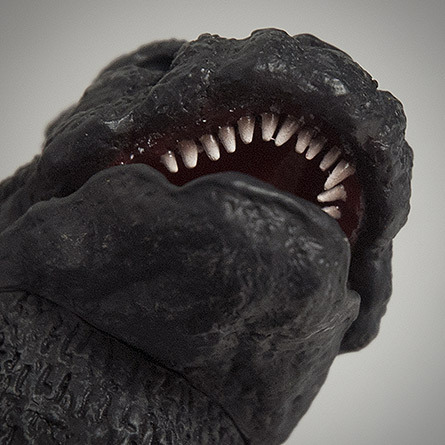 The inside of the mouth is painted in a deep, dark red and it seems like the teeth have been given a glossy coating making them shine in the light. 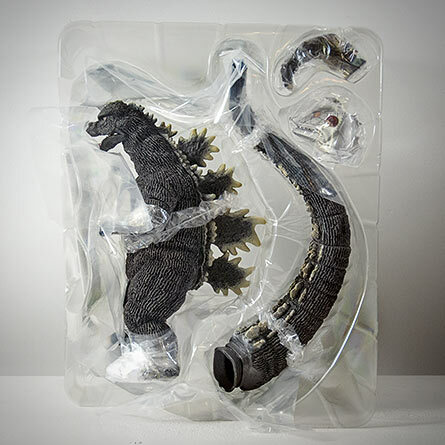 Collectors at the X-Plus Kaiju Collectors’ Club on Facebook have mentioned that the dorsal fins should actually be more silver than they appear on this figure. Again, I’m not an expert on details like this but I thought I’d still pass that info along. 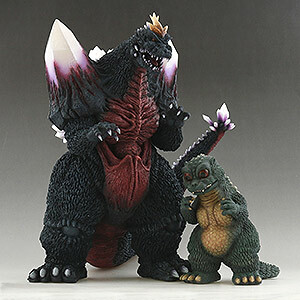 Sizewise, the X-Plus 25cm Godzilla 1975 fits in perfectly with his other incarnations. 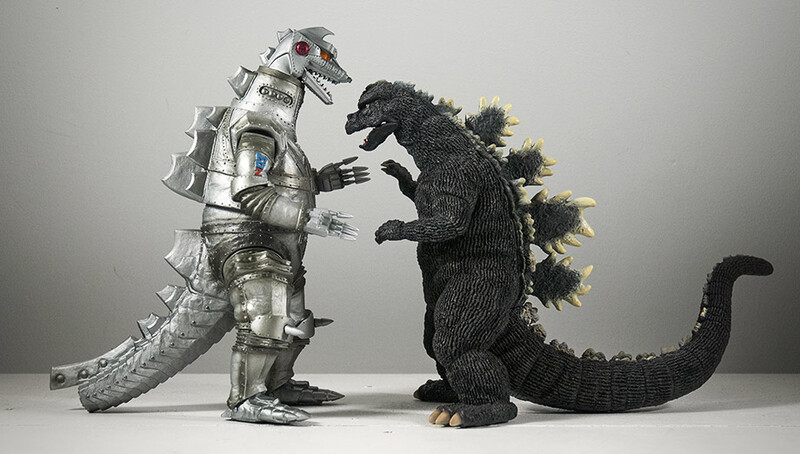 The X-Plus Godzilla 1975 is almost a whole head shorter than the Mechagodzilla 1975. These figures were released only three months apart. Didn’t X-Plus think collectors would pair them up? Some collectors have told me that Godzilla is shorter because he’s hunched or that Mechagodzilla actually was a lot taller in the movie. I plan to watch the movie again to find out what’s going on here. NOTE: There is no size comparison photo with the Coke can this time around as I didn’t have a photo to place beside it. 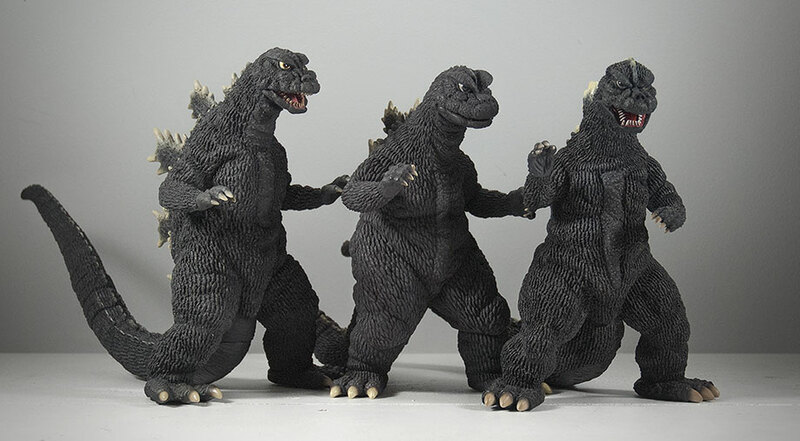 If you are a new collector and would want to see something that would give you an idea of this figure’s real size, please take a look at the Godzilla 1966 Review as they are roughly the same height. 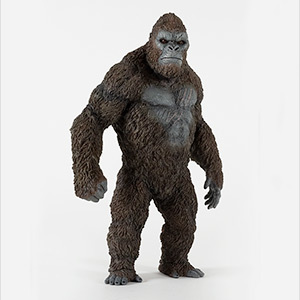 This figure’s tail makes a hard turn to its right making it easier to display it on the shelf facing your right. Being 13 inches long, it’s possible to make this figure face full front on a standard shelf. 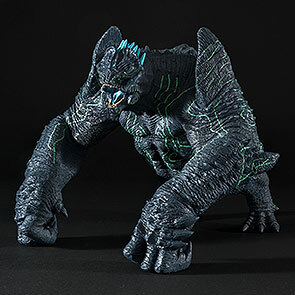 This figure comes in the standard Giant Monster Series style window box. The main figure comes in two pieces, each wire tied into a plastic shell. You’ll need to attach the tail to the body using a hairdryer or boiling water to soften the flange at the opening. The tail “hole” on this figure is smaller than usual and is tucked in deeper behind the legs. The end of the tail is elliptical except for the top which is flatter. This, and the smaller hole, made it a tad harder for me to assemble. • Link to archived page at X-Plus website. • Rich Eso’s Large Monster Series Godzilla 1975 Video Review. Great review! Maybe Dave will let you post his pic of how he customized his G75’s upper lip.